Yesterday was Mr. Savvy's birthday and we were out celebrating last night. I have been busy working on a couple projects this week and never did get a post together for today. I thought I would share this very old post from spring 2010 and show you how the great room looked then after some changes that I made that really didn't stay around very long. 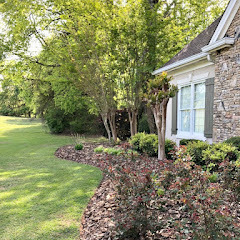 I know I have a lot of new readers since 2010 so I hope you will enjoy seeing what my home looked like back after I started blogging. Please excuse the quality of the photos. This was before getting my good camera. 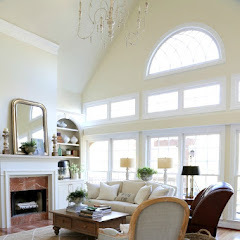 ......to change the great room from a warm look for fall and winter to a lighter and cooler look for spring and summer. It is all y'all's fault, too. Since I started blogging and getting inspired by your projects and slipcovered wonders it has made me want to change a few things. I wish I knew how to make fitted slipcovers, but I don't. I would love to have some custom made, but cannot at this time. 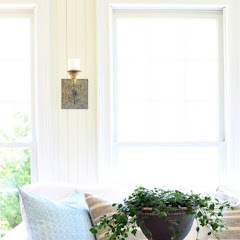 So, I checked out ebay and found some great alternatives from Pottery Barn at greatly reduced prices that still gave me the look I was going for. I have also been doing more flea marketing and antiquing since I started looking at your blogs. So, see it is all y'all's fault!! New natural box pleated slipcovers to lighten up the brick red sofa. Changed the darker and heavier pillow covers to lighter ones that I already had stored. Changed the accessories on the mantel to white potted plants, wicker chargers, green plates, bird house and bird for a fresher and layered display for the warm season. I had all these things. Antique wicker tray filled with antique and flea market treasures and design books. and the old bottles were found many years ago by Mr. Savvy on his childhood home site. Fern added to the fireplace, which is a southern thing, and flowers added to the coffee table. I keep forgetting to mention that Mr. Savvy designed and built the mantel all by himself. He also replaced the original white marble tile with grey veining to the new marble tiles I chose. He is very proud of that mantel. I love the way the room feels now. Don't be surprised if I make some more changes since I may want to change some of the displays on the built-ins with fresher looks. I am sure I will find some things at the antique and flea markets that just may want to come home with me. If you want to see the before you can see it HERE. Did you enjoy going back in time? The slipcovers didn't stay on long. It just wasn't me. This room doesn't even look anything like this anymore. So many changes in four years. 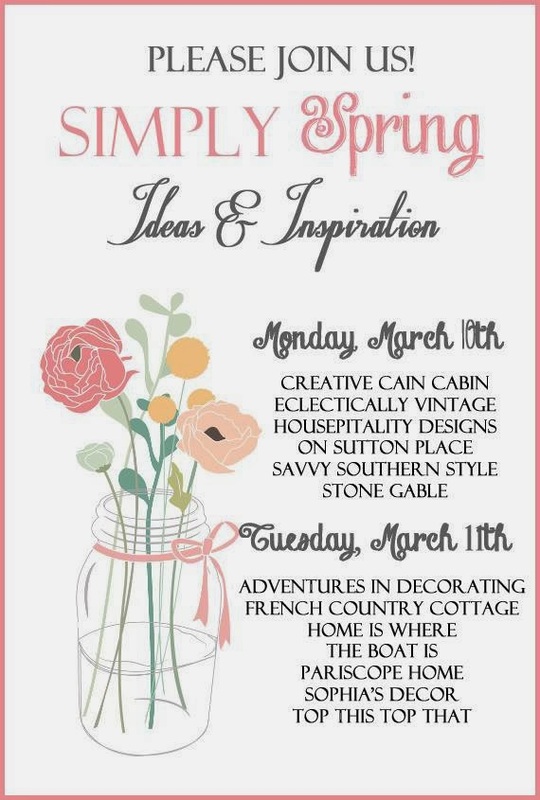 Be sure to return on Monday for how I have started decorating for spring this year. I am joining 11 other bloggers who will be sharing over a two day period. I always love looking at pictures from the past - especially in your home since it's always so beautiful! I love the green and the touches of spring! By the way, remember to turn your clocks tonight! I had th same thought when I saw the slipcovers: that it didn't look like YOU:) It is fun to look back though. Your home is a showcase. Mr. Savvy should be very proud of the mantle. Joe was when he built the one in the old house too. Have a great weekend and HAPPY BIRTHDAY to Mr. Savvy!!!!!!!!!!!!!!! Well I liked the look very much, but then again I am partial to the slipcovers. But I'm happy you changed your look since I am now the recipient of those slipcovers! Happy Birthday to Mr. Savvy! Hope he had a good one yesterday. Wow...this room has certainly evolved over the last 4 years!....the room looked beautiful ! !...Happy Birthday to Mr. Savvy!!! Isn't it funny to look back at photos.My house changes weekly LOL! Love all of your changes.Your style is beautiful and you always keep it fresh....love it Kim! Then, now, yesterday, tomorrow...I always love your home. A belated Happy Birthday wish to Mr. Savvy! Kim, your style is timeless. A belated Happy Birthday to Mr. Savvy. Your home in all the seasons and throughout your blogging years has always been pretty and inspiring, Kim. I love love love the way you decorate..... It's so pretty thanks for sharing and thanks for some sweet ideas !!! I like the look but I am with Kelly with loving the slipcover look. 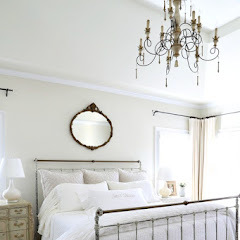 Your room always looks beautiful and reflects your great design style. Have a great week end. Happy Birthday to your hubby. 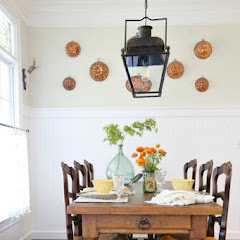 Your home has changed so much and yet your style is still so obvious in these photos. You have amazing talent for decorating. Love your blog. Belated birthday wishes to Mr. S! This post must have from the time before I started reading blogs because I don't remember the slipcovers. Although I admire slipcovers in other people's rooms, I don't think they'd work for me, either. Really like that green and white stripe pillow cover, though! Very pretty space, but I love your red chair and sofa you have now! I think they look perfect with the fireplace. M Savvy should definitely be proud of that mantel. I've been admiring it for so long! 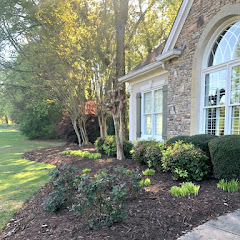 I can't wait to see more of your spring decor. Cannot believe how different the room looks...it certainly was so beautifully dressed for Spring!...you decorate so classically! The room looks so different now, it's always amazing looking back in time. For me anyway sometimes I look at things and think..."really what were you thinking". Your Mr. Savvy did an excellent job on the mantle. You should be very proud of him. I do love the fern in the fireplace though, it is a very southern thing. Thanks for sharing it. 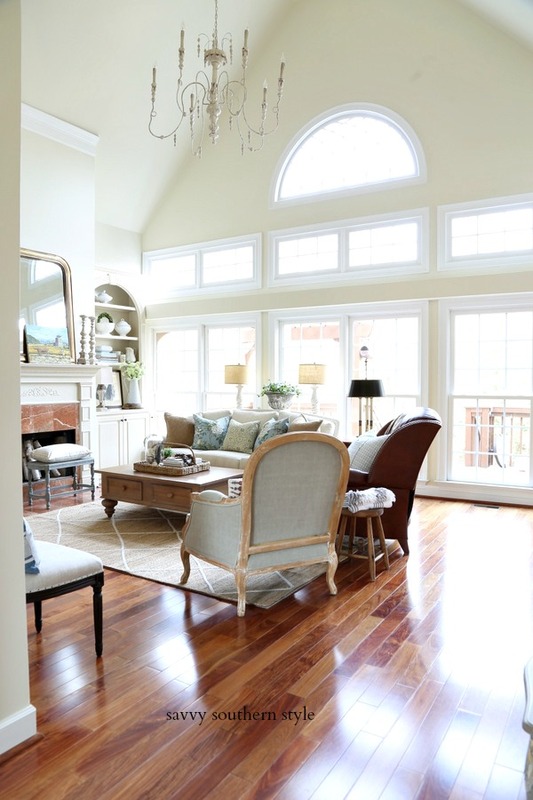 Like you, I love looking at the neutral rooms and think they're beautiful. But, when I pick out something for m own home, I always seem to come away with color. Your home is beautiful and you have wonderful color sense. It's so cheerful and cozy.